A unique insider's account of day-to-day life inside a Tibetan monastery, The Sound of Two Hands Clapping reveals to Western audiences the fascinating details of monastic education. 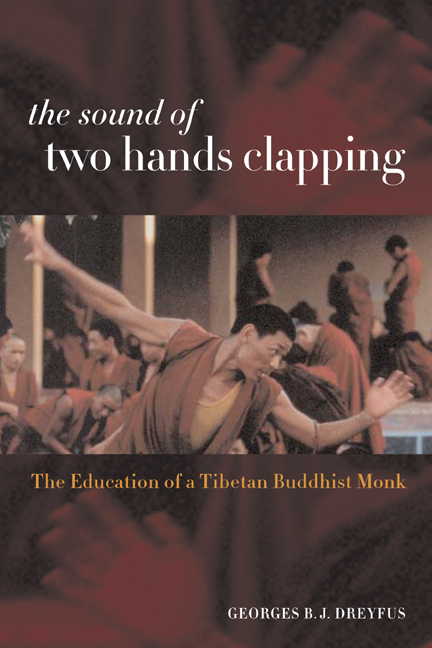 Georges B. J. Dreyfus, the first Westerner to complete the famous Ge-luk curriculum and achieve the distinguished title of geshe, weaves together eloquent and moving autobiographical reflections with a historical overview of Tibetan Buddhism and insights into its teachings. Georges B. J. Dreyfus is Professor of Religion at Williams College. He is author of The Svatantrika-Prasangika Distinction: What Difference Does a Difference Make? (coedited with Sara McClintock, 2002), Recognizing Reality: Dharmakirti's Philosophy and Its Tibetan Interpretations (1997), and A Recent Rediscovery: rGyal tshap's Rigs gter rnam bshad (in collaboration with S. Onoda, 1994). 9. The Supplement: Hermeneutical or Deconstructive? 12. Is Debate a Mode of Inquiry?